The Anderson DTG Digital Temperature Gauge carries on the tradition of accurate and reliable electronic temperature indication, while incorporating many new features tailored to a growing industry. This "next generation" product provides high accuracy temperature monitoring in an operator friendly simple to read design. The DTG also offers new options for remote mounting as well as high and low switches for critical applications where user-defined setpoints can be easily programmed. The battery-operated version can be ordered with or without a secondary 100 ohm 3-wire RTD. The secondary RTD option is ideal for applications that require local indication, as well as remote recording. As only one vessel penetration is required, a cost savings can be realized. The DC powered version supplies two (2) SPST low voltage contacts assigned to the adjustable setpoints. An optional remote relay module is available that provides SPDT relays rated 6 amps at 250 VAC. 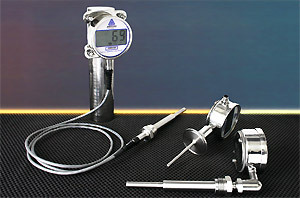 All models feature simple field calibration for fine tuning to the plant reference standard. As such, the DTG makes a perfect and cost-effective replacement for any mechanical thermometer, from bi-metals to mercury-in-glass. With resolution to a tenth of a degree, the DTG takes the guesswork out of reading dials and mercury columns. And, because it’s an Anderson Pharmaceutical Series, you get the added value of all 316L electropolished wetted parts, customer specified permanent tagging, a certificate of calibration, and CMTRs with every unit at no additional cost.